It's been so busy that I forgot to post lunch yesterday! We've finally decided that we're painting the house and so now there is so much to do. I've also been considering some bedroom furniture sets for Kidlet and I. So much to think about! 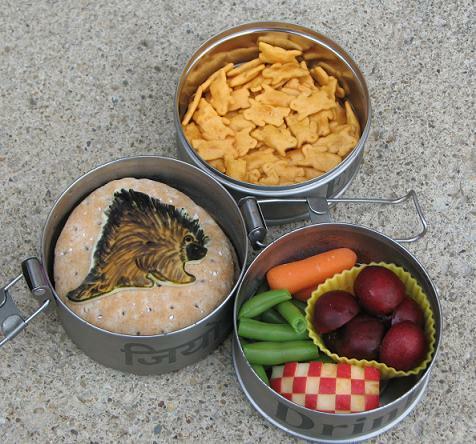 Yesterday's lunch for Zoo Camp is packed in our brand new Tiffin box. More about that below. Kidlet has a Porcupine made of cheese and food colors on top of a chick'n patty sandwich. On the side are checkered apple, cherries, green beans, carrots, and cheddar bunnies. Please excuse the sideways picture. No idea what is going on there. But you can see on one side of the Tiffin it says Eat.Drink.Live in English and on the other it says the same thing in Hindi! Our neighbors are Indian and Kidlet recognized the Hindi right away and so this tiffin came home with us. I must say I am very pleased with how durable and easy to wash it is :D Yay tiffin! Cool stenciling! 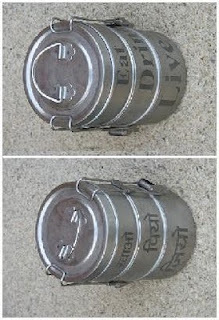 I love this tiffin. I have it in 1-, 2- and 3-tier versions. Without the stenciling. But what a cool idea to try! Love love love the porcupine!!! The tiffin is pretty cool too, thanks for adding this, it's awesome! I love this box. Is it easy for him to open? I have heard nothing but good things about them. Love that they are not plastic. As always, your work is amazing. Kidlet is so blessed to have a cool mom like you!